Do you ever think about the amount of food you produce in a day, a week, or a month? How about the amount of food that doesn’t even see a fork or spoon, but just gets tossed in the trash? That has been the sad story for the food scraps that are produced in our culinary labs here at Paul Smith’s College. In fact, three years ago there was a campus-wide program known as “Food Scraps for Pigs” where pre-consumer food waste from Cantwell, as well as the dining hall was being used by Atlas Hoofed It Farm, in Vermontville, NY, to feed pigs. There were challenges with pickup and consistent collection of scraps, so the program wasn’t continued, but recently Emily Sommer’s Farm to Table class has partnered with Sustainability Coordinator Kate Glenn and Jake Vennie-Vollrath of Moonstone Farm, to collect and donate our food scraps to Moonstone Farm for animal feed and compost. 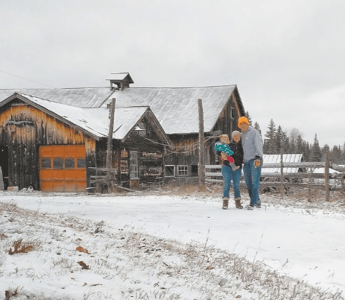 The Farm to Table culinary class, part of the new two-year accelerated culinary program, was visiting Moonstone Farm on a monthly basis, “to get their hands dirty and learn more about the ins and outs of running a small farm in the Adirondacks”, as Jake explained to me. The class also started to brainstorm ideas on how to solve some of the problems the farm was facing. One of these lurking issues happened to be “inputs” and soil health, which Jake was currently sourcing compost from Vermont to solve. Thus caused Emily and the class to start thinking they could have a real potential impact if they were to start diverting the pre-consumer waste from the culinary labs here on campus to Moonstone Farm. Emily then mentioned the project to Kate Glenn, Sustainability Coordinator for the college, and so the wheels began to turn. Kate Glenn then organized a planning meeting with the facilities department, Sodexo, and Emily to develop and establish a written plan and procedures for the project. During the meeting it was discussed who would collect the buckets, how they would be delivered and other remaining logistics. With the purchase of five gallon buckets, funded by the Sustainability Grant, the project was officially up-and-running. Additionally, Kate brought in the support from Sodexo to have the dining hall’s pre-consumer food waste also be diverted to the farm. 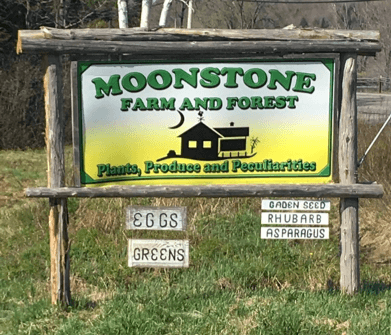 “Moonstone Farm specializes in growing heirloom vegetables organically and healthy soils grow tastier vegetables”, says Jake. The food waste serves a variety of purposes on the farm, such as feeding chickens directly, feeding mealworms and black soldier flies which eventually feed the chickens, while the rest is “…composted to create organic matter for our greenhouses, hopyard, fruit trees/bushes, and vegetable fields.” In the short time of a month, the dining hall has collected 218.2 pounds of pre-consumer food waste thanks to the help of Sodexo employees. Meanwhile, the Culinary Department has gathered 251.2 pounds with the help of students and instructors. Evidently, this diversion of food waste is serving an extremely more purposeful objective than it would sitting in a landfill spewing off methane gas Furthermore, this practice allows for a decrease in the heavy food waste facilities has to dispose of, and can be reflected on the college’s Greenhouse Gas Report, which tracks the production of methane. Pre-consumer food waste is often overlooked when discussing composting practices, causing it to become a growing problem. This type of composting specifically focuses on the scraps that are a byproduct of food preparation. Food loss and waste accounts for about 4.4 gigatonnes of greenhouse gas emissions (GHG) per year. To put this in perspective, if food loss and waste were its own country, it would be the world’s third-largest GHG emitter – surpassed only by China and the United States” (“Food Waste Facts”). A large portion of this food waste could be gold for many farmers in helping them restore nutrients to their soil. Jake shares that, “Not only is reducing food waste (or redirecting it to better uses) economically smart, it might be the easiest thing that we can do to address global warming.” The implementation of more programs like these across the United States is essential to help combat the negative effects of food waste. This project serves as a perfect example of discovering an issue and developing a working solution. 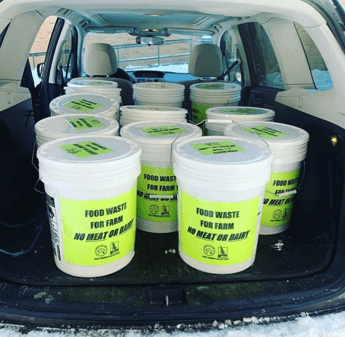 The Smitty Sustainability Committee fully supports the efforts of all the people involved in this project, especially the students who are filling the buckets with proper pre-consumer food scraps. The committee is currently working with the dining hall to design an effective program to tackle post-consumer food waste on campus. We will be implementing a separate bin labeled compost and providing signage that educates students on what they can scrape into the bin later in the spring semester. Combating food waste is an extremely critical issue that needs action sooner, rather than later. By keeping the conversation and programs like this going, everyone involved hopes to have a significant positive impact. The Waste Reduction Team has been sorting garbage out of the recycling for almost two semesters now. There are currently five students on the team, and at least one member is sorting garbage out of the recycling every day. We have had a good volume of recycling from the campus community, but we can always handle more, so don’t be afraid to wash out those plastic food containers and add those to your recycling. Over the course of the past semester, we have found some very strange things in some of the recycling bags we have received from both resident halls and other buildings on campus. One of our most recent discoveries was a dead squirrel in a pizza box, which is most definitely not recyclable. Other than this very unique find, we have also been coming across many half full coffee cups in the recycling. These coffee cups are not recyclable with coffee still in them, and the coffee is also soaking all of the paper in these bags. Throwing your half full coffee cups in these zero-sort bags makes it so we cannot recycle most of the contents within these bags. Also, plastic water bottles that still contain water should be poured out before placing them in the recycling bin. Now that the Waste Reduction Team is enduring colder temperatures, it would make our job much more efficient if you could only use blue bags to put your recycling in from your resident hall. We have been sorting through all bags that are put in dorm recycling bins due to the fact that some people are not using only blue bags for recycling. As you could imagine we have found some pretty repulsive stuff searching through bags that appear to be recycling but are actually trash. We would like to kindly ask you to please make sure that what you are putting in the recycling bin is actually recyclable and will not ruin the ability to recycle whatever else may be in the recycling. Thank you! Recently, the Center for Campus Sustainability has hired four students as part of a new Waste Reduction Team: Zoe Plant, Grace Seltzer, Thomas Szabo, and Julie Hogan. As part of their duties, they will be assessing our current recycling and food waste systems, while developing and implementing a plan to collect and sort recycling and food waste for proper disposal. We look forward to improving our recycling and waste management efforts here at Paul Smith’s College with all of their great help! There is a misconception on campus that we do not recycle, but we do! We have a zero-sort (Single Stream) recycling here at Paul Smith’s College. That means that all of the recycling can go in one blue bin, BUT WE HAVE TO SEPARATE TRASH AND RECYCLING. 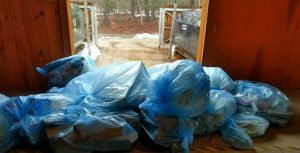 If the central recycling dumpster is 10 % or more contaminated with non-recyclable material, then Casella Waste Services will have to throw out our entire dumpster of recycling. 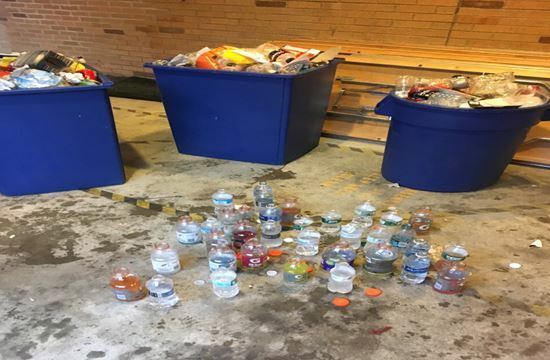 In order to prevent this, if our custodial workers see a recycling bin on campus that is contaminated, they will throw out the entire bag to stop it from contaminating the dumpster. The system does not accept window glass, mirrors, light bulbs, dishes, Pyrex, ceramics, foam packaging, Styrofoam, plastic bags, recyclables that contain food waste, paint or oils, hazardous materials, or universal waste. Plastic bags are recyclable, but they cause jams within our system, which is why we do not accept them. If you want to recycle your plastic bags, Tops Friendly Markets (located in Saranac Lake) can take them. Recyclables that contain food waste is the main reason why many of the recycling bins become contaminated. You must rinse out all recyclable items thoroughly in order for the system to accept it. If you are ever unsure if an item is recyclable or not, throw it in the garbage!